What is the Best Smartphone You Can Buy Today? Since this article was first written, an updated version has been posted here. Check it out. A lot has changed. Who makes the world’s best smartphone? Most people would probably say the iPhone 4S, since it seems like everyone has one. But is it really the best? Let’s find out. 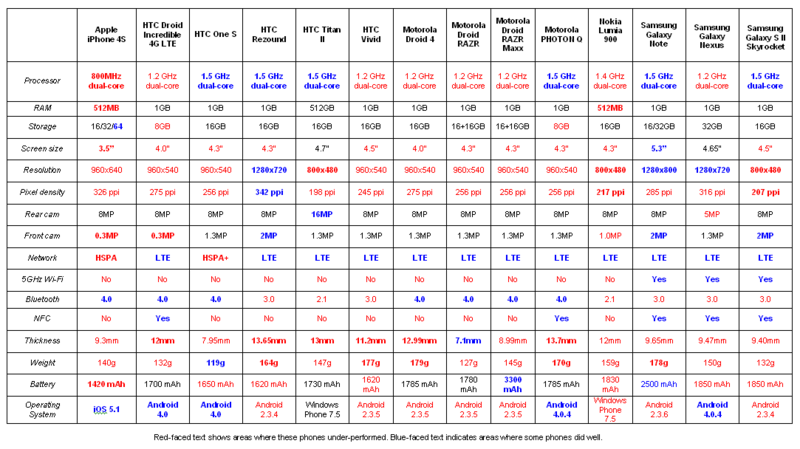 I started by making a chart of the specs for all currently available smartphones from U.S. carriers. Creating the above list was not easy because there are phones like the Samsung Galaxy Note, HTC Rezound, Samsung Galaxy Nexus, HTC One S and Motorola Droid Razr Maxx which excel in some areas, but lag in others. However, in the end all of those were dropped because the above phones were better overall. As you can see from the chart above, when it comes to specs, the Samsung Galaxy SIII beats or ties the best smartphones in all areas except pixel density and weight. Even in those areas, it’s no slouch. Most reviewers would probably give second place to the HTC One X, but the LG Nitro HD wins in both lightness and pixel density. The HTC Evo 4G LTE and Motorola ATRIX HD are also very good phones. There is a fairly long list of smartphones which are good, but don’t deserve to be on the “best” list because they are flawed in one or more areas. You can view these in the chart below. Click on the chart below to make it larger and more readable. Red-faced text shows areas where these phones under-performed. Blue-faced text indicates areas where some phones did well. Although iPhone 4S sales continue to be strong, it no longer competes when it comes to most specs. Several Android phones have quad-core processors, while the iPhone 4S only has a dual-core processor. I didn’t include those in the above chart, because they’re not available in the U.S. yet. The best Android phone is 24% thinner than the iPhone 4S (Droid RAZR 7.1mm vs 9.3mm). 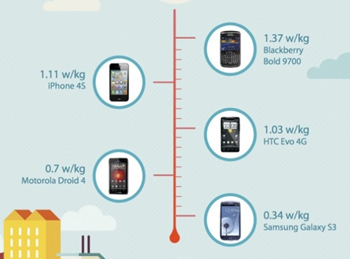 At least 8 other Android phones are thinner than iPhone 4S. Many Android phones have microSD slots, so consumers can easily and cheaply exceed the 64GB internal memory of most expensive iPhone 4S. The best Android phones support NFC for easy purchasing and LTE for lightning-fast data speeds up to 30x faster than iPhone 4S. The iPhone 4S has none of this. The best Android phone has a battery with more than twice the power of the iPhone 4S (Droid RAZR Maxx 3300mAh vs. 1420 mAh). This translates to over 21 hours talk time versus 14 hours talk time). There is hope for Apple however. An iPhone 5 is rumored to be coming this fall. After it is released, I’ll update this chart and see how it compares to the other smartphones available at that time. It is surprising that the world’s most popular phone gets beat in every single spec listed above. This didn’t used to be the case. It used to be the other way around with iPhone dominating smartphone specs. There is still one thing that the iPhone 4S can beat Android phones at: cellphone radiation. The iPhone 4S has over 300% more radiation than the Samsung Galaxy SIII. 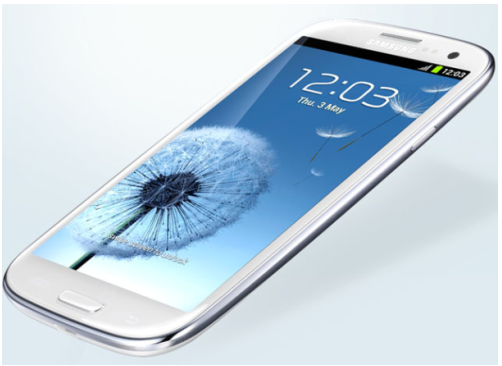 That’s very surprising because the Samsung Galaxy SIII has more radios and is capable of much higher data speeds than the iPhone 4S. If you own an iPhone 4S, you might want to get a Bluetooth earpiece if you don’t have one already. If you think I missed a phone that should be considered here, please let me know. P.S. Some of you are probably thinking this article relates to only hardware — not software. You’re right. Read this to see how Android compares to the newest version of iOS. One Response to What is the Best Smartphone You Can Buy Today?